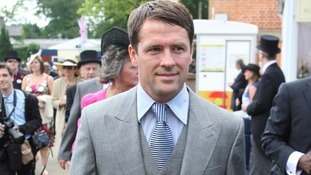 The Queen will be hoping her much-fancied horse Estimate triumphs in Royal Ascot's Gold Cup today. Her thoroughbred filly is favourite to win the prestigious race on Ladies' Day. Nick Smith, head of communications at Ascot, said: "We are delighted with the standard of dress we are seeing in both the royal enclosure and the grandstand. The new dress code has clearly had a positive impact on that. He added: "We always said that we would adopt the new rules sensitively using common sense and discretion, especially in the first year of its implementation, and that is what we are doing." A number of race-goers chose patriotic outfits for the first day of racing at Royal Ascot in celebration of the Queen's Diamond Jubilee. The week is always a highlight of the social and sporting calender, with the fashion states set particularly high. Jackie St Clair, a former girlfriend of music mogul Simon Cowell, wore a headpiece made from a giant Union flag bow, created by Siggi at Harrods. The Queen was greeted by cheers and applause as she arrived for a day at the races at Royal Ascot. Shouts of "God save the Queen" rang out around the Berkshire racecourse's parade ground as she entered in a traditional horse-drawn royal carriage procession. The Queen was accompanied by the Duke of Edinburgh, who appeared fit and well following his recent stay in hospital that caused him to miss part of the Diamond Jubilee celebrations. The Queen wore a dress and coat in pale blue by Stewart Parvin with a matching hat by Rachel Trevor-Morgan. She and the Duke were joined by the Viscount Ullswater and Lord Vestey. 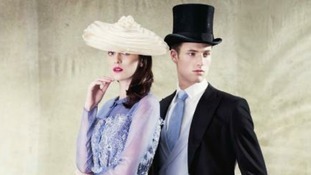 Royal Ascot gets underway today and organisers will be keeping a close eye on what people choose to wear.